Every Ranger Products hydraulic power unit can be mounted to multiple car lift models, but it’s important to know what you’re lifting before making a purchase. (This is true of both your ​auto lift and your power unit.) In most cases, a larger motor and deeper well in your reservoir will translate to faster lifting times and better overall efficiency, but not everyone is lifting 5,443-kg. trucks. So, we designed this unit as the “little brother” of our hydraulic power pack collection. It has a smaller tank to accompany its 1.5 HP motor. We can tell you that less is more with this particular power unit. We’re proud of the efficiency of its design, as well as its versatility. The unit was made with our low-rise lifts in mind, which means it can easily power the LR-5T 4,536-kg. capacity low-rise car lift. When it comes to efficient lifting, this “little big guy” takes the cake, which is something to keep in mind if you think the tank size of your hydraulic power unit is all that counts. The 1.5 HP motor runs extremely quiet and is kept completely covered from dust, dirt, falling debris and even high humidity. Ranger gives you the confidence to operate your hydraulic power pack when in scorching heat or bitter cold (-25 – 79°​C). In some cases, our power units are even tougher than the operators. It’s easy to lift your car lift with the touch of a button, but most impressive is the way the E0.8B8F1 efficiently utilises gravity during descent for lower electrical output. This saves on the cost of electricity and reduces wear on your equipment. 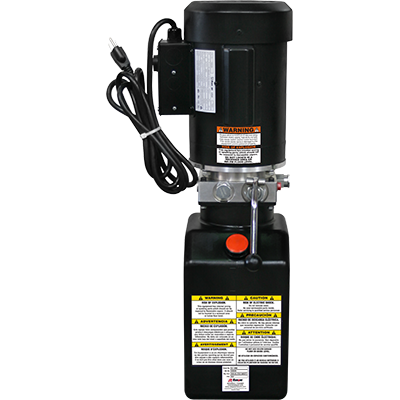 If you have any questions about which other car lifts this hydraulic power unit works with, or if you’re not sure which unit is best for you, be sure to give us a call.